If you are looking for information on the New York Pizzeria franchise business opportunity, NY pizzeria franchises or New York Pizza franchising, then you have come to the right place. New York Pizzeria is a fast casual Italian restaurant with more than 20 locations. Our concept is a perfect fit for the average consumer looking to find an old school pizzeria. New York Pizzeria provides that neighborhood feel, giving the customer a unique dining experience that separates us from the big chains. Every meal is cooked to order, using recipes passed down through generations. Why choose to franchise with NY Pizzeria? At New York Pizzeria, quality comes first. It is a ritual to prepare our pizza dough and sauce daily. Our in-house bread is baked fresh so every bite leaves you with a flavor to remember. Our pizza contains fresh herbs, spices and extra virgin olive oil. The freshness of our ingredients sets us apart from our competition. We want you to build the best pizza. With our knowledge of the pizza industry, we'll guide you step by step. You'll have the freedom to enjoy running your own business, without the worry of someone looking over your shoulder. Management Support: Our team is there to assist you with the design, build-out, equipping, and start-up of your franchise. Price: Great food, priced right. You'll benefit from our buying power when you purchase from our approved vendors. Products: You won't find a commissary delivering our products, fake dough, pre-made sauce, imitation cheese or any of the other shortcuts you may find in some of the larger chains. The New York Pizzeria corporate staff is here to help. Our ongoing consulting support is designed to enhance your business strategies and tactics. We will work with you in order to improve your organization's operations, marketing, human resources, and market penetration efforts. We offer assistance in new market menu creation. We will work with you to design a menu that will fit your customer base helping to create a unique identity within your community. We also help with grand opening planning, marketing programs to reach your customer base, and many other marketing activities and functions. Information Technology is what allows us to stay ahead of our competition. Ntouch is our point of sale system of choice in our restaurants. Our fully integrated POS software system allows us to provide valuable information from managing prime cost solutions, to labor and inventory modules. Using our Extranet, called New York Pizzeria Web-Ex, you will also have online access to our manuals, management programs, local marketing updates, as well as new product and menu information. Q. What types of franchises are available? A. Individual and multiple store franchises are available. Q. What is the term of the franchise agreement? Can it be renewed? A. The term of the franchise agreement is 10 years. It can be renewed for another 10 years at the then current franchise royalty fee. Q. Can I sell my franchise? A. A franchisee's business can be sold with the franchisor's approval. Q. How do I learn the business? Is there a training school? What does it cost? A. 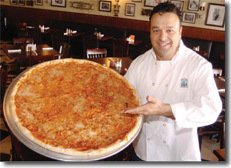 New York Pizzeria provides a complete training program for you and your personnel. This is included in your franchise fee. Q. What is my protected territory? A. A one mile radius is protected around your store except in downtown areas. If you have a mall store, you are only protected in that particular mall and not outside the mall with any radius. Q. Who finds the site? A. We provide site guidelines and assist you in site selection, but you will find your own site and submit it for approval. Q. How long does it take to open a New York Pizzeria Franchise? A. The time varies, but normally 60-90 days after build out begins.